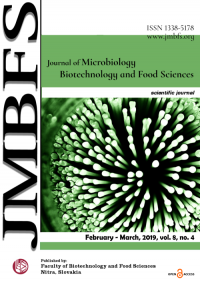 The Journal of Microbiology, Biotechnology and Food Sciences (JMBFS) (ISSN:1338-5178) is an open access journal that provides publication (six times per year) of scientific articles in all areas of the subject. 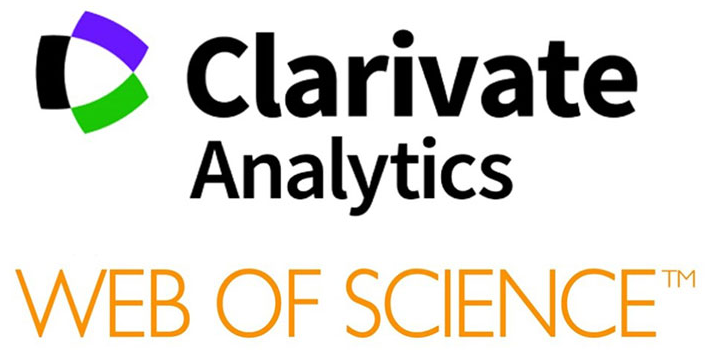 The Journal welcomes the submission of manuscripts that meet the general criteria of significance and scientific excellence. Papers can be published approximately two month after acceptance. Submit your manuscript using the electronic submission system www.office.jmbfs.org. Max 7 days after submission, your manuscript will have a number assigned and pre-reviewed. Electronic submission of manuscripts is encouraged, provided that the text, tables, and figures are included in a single Microsoft Word file (preferably in Times new roman font). Here is a template by which you should write articles. Cover Letter: A cover letter must be uploaded with the manuscript in a separate WORD file that should include the name, mailing address, contact information (affiliation, phone number and e-mail address) and research interest of four (4) experts in the field as potential reviewers for the manuscript. The cover letter should also include the name and e-mail address of the corresponding author. Here is Cover letter template. 4. reviewers can not be a co-authors in submitted research study. The cover mail should include the corresponding first author full address and telephone numbers and should be in an e-mail message sent to the Editor, with the file, whose name should begin with the first author’s surname, as an attachment. The Journal of Microbiology, Biotechnology and Food Sciences will accept manuscripts submitted using the electronic submission system only. Short Communications: A Short Communication is suitable for recording the results of complete small investigations or giving details of new models or hypotheses, innovative methods, techniques or apparatus. The style of main sections need not conform to that of full-length papers. Short communications are non-limited in length. Reviews: Submissions of reviews and perspectives covering topics of current interest are welcomed and encouraged. Reviews should be concise, non-limited in length, but it must contain minimal 8000 words except references. Reviews are also peer-reviewed. All manuscripts are reviewed by a qualified home and outside reviewers, also members of the editorial office. Decisions will be made as rapidly as possible, and the journal strives to return reviewers comments to authors within 10 weeks. The editorial board with reviewers cooperation will re-review manuscripts that are accepted pending revision. It is the goal of the JMBFS to publish manuscripts within 2 or 4 months after submission. Single-blind review is using for consideration. All portions of the manuscript must be typed one-half. The pages may not be numbered, those assigned Editorial office. The Title should be a brief phrase describing the contents of the paper. The Title Page should include the authors’ full names and affiliations, the name of the corresponding first author along with e-mail and phone number. Following the abstract, about 3 to 7 key words that will provide indexing references should be listed. A list of non-standard Abbreviations should be added. In general, non-standard abbreviations should be used only when the full term is very long and used often. Each abbreviation should be spelt out and introduced in parentheses the first time it is used in the text. Only recommended SI units should be used. Authors should use the solidus presentation (mg.ml-1). Standard abbreviations (such as ATP and DNA) need not be defined. Materials and Methods should be complete enough to allow experiments to be reproduced. However, only truly new procedures should be described in detail; previously published procedures should be cited, and important modifications of published procedures should be mentioned briefly. Capitalize trade names and include the manufacturer’s name and address. Subheadings should be used. Methods in general use need not be described in detail. Results should be presented with clarity and precision. The results should be written in the past tense when describing findings in the author(s)’s experiments. Previously published findings should be written in the present tense. Results should be explained, but largely without referring to the literature. Discussion, speculation and detailed interpretation of data should not be included in the results but should be put into the discussion section. The Discussion should interpret the findings in view of the results obtained in this and in past studies on this topic. State the conclusions in a few sentences at the end of the paper. The Results and Discussion sections can include subheadings, and when appropriate, both sections can be combined. Conclusion. The conclusion should include the most important idea of the experiment, the author’s own findings, possible solutions to the problem, recommendations for further research, etc. Tables should be kept to a minimum and be designed to be as simple as possible. Tables are to be typed one-spaced throughout, including headings and footnotes. Tables should be prepared in Microsoft Word. Each table should be included directly in text and numbered consecutively in Arabic numerals and supplied with a heading and a legend. Tables should be self-explanatory without reference to the text. The details of the methods used in the experiments should preferably be described in the legend instead of in the text. The same data should not be presented in both table and graph forms or repeated in the text. Figures should be numbered and are included directly in text. Graphics should be prepared using applications capable of generating high resolution GIF, TIFF, JPEG or PowerPoint before pasting in the Microsoft Word manuscript file. Use Arabic numerals to designate figures and upper case letters for their parts (Fig 1). Begin each legend with a title and include sufficient description so that the figure is understandable without reading the text of the manuscript. Information given in legends should not be repeated in the text. We respected APA style for references. Google scholar generates APA style automatically. References should be listed at the end of the paper in alphabetical order. Articles in preparation or articles submitted for publication, unpublished observations, personal communications, etc. should not be included in the reference list but should only be mentioned in the article text. Authors are fully responsible for the accuracy of the references. NECESSARY point: If article has DOI number, it must be included to references part after cited article in original form. You can find some examples prepared by CrossRef. Article: Saiki, R. K., Gelfand, D. H., Stoffel, S., Scharf, S. J., Higuchi, R., Horn, G. T., … & Erlich, H. A. (1988). Primer-directed enzymatic amplification of DNA with a thermostable DNA polymerase. Science, 239(4839), 487-491. Book: Nunnally, J. C., Bernstein, I. H., & Berge, J. M. T. (1967). Psychometric theory(Vol. 226). New York: McGraw-Hill. Html: Beringer, J., Arguin, J. F., Barnett, R. M., Copic, K., Dahl, O., Groom, D. E., … & Eidelman, S. (2012). Review of particle physics. Physical Review D, 86(1). Conference article: Pliszka, S. R., Greenhill, L. L., Crismon, M. L., Sedillo, A., Carlson, C., Conners, C. K., … & DISORDER, H. (2000). The Texas Children’s Medication Algorithm Project: Report of the Texas Consensus Conference Panel on Medication Treatment of Childhood Attention-Deficit/Hyperactivity Disorder. Part I. Journal of the American Academy of Child & Adolescent Psychiatry,39(7), 908-919. Guidelines from internet: European Committee on Antimicrobial Susceptibility Testing. (2013). EUCAST guidelines for detection of resistance mechanisms and specific resistances of clinical and/or epidemiological importance. EUCAST, Basel, Switzerland: http://www. eucast. org/fileadmin/src/media/PDFs/EUCAST_files/Resistance_mechanisms/EUCAST_detection_of_resistance_mechanisms_v1. 0_20131211. pdf. We accept also journal abbreviations. Please follow dots, lines, spacing and italics type of journal titles. Short Communications are not limited in lenght. They should present a complete study that is more limited in scope than is found in full-length papers. Short Communications has the following differences: (1) Abstracts are limited to 150 words; (2) instead of a separate Materials and Methods section, experimental procedures may be incorporated into Figure Legends and Table footnotes; (3) Results and Discussion should be combined into a single section. Proofs and Reprints: Electronic proofs about the printing will be publish at the JMBFS website like the PDF file. Page proofs are considered to be the final version of the manuscript. With the exception of typographical or minor clerical errors, no changes will be made in the manuscript at the proof stage. Because the JMBFS will be published freely online to attract a wide audience, authors and others visitors will have free electronic access to the full text (in PDF) of the article. Authors and others visitors can freely download the PDF file from which they can print unlimited copies of their articles. Copyright: Submission of a manuscript implies; that the work described has not been published before (except in the form of an abstract or as part of a published lecture, or thesis) that it is not under consideration for publication elsewhere. The originality and uniqueness of the article authors are responsible. All copyrights remain the author of the article. Fees and Charges: Authors are not required to pay handling fee. Publication of articles in the Journal of Microbiology, Biotechnology and Food Sciences is free.